Abu ‘Ali Al-Hasan bin Al-Haytham (965-1040 C.E.) was one of the most eminent physicists, whose contributions to optics and scientific methods are outstanding. Known in the West as Alhazen, Ibn Al-Haytham was born in 965 CE in Basrah, and was educated in Basrah and Baghdad. Thereafter, he went to Egypt, where he was asked to find ways of controlling the flood of the Nile. After failing in his attempt to regulate the flow of the Nile, Ibn Al-Haytham feared that al-Hakim would punish him. To avoid punishment, he pretended to be insane until al-Hakim’s death. He also traveled to Spain and during this period, he had ample time for his scientific pursuits, which included optics, mathematics, physics, medicine and development of scientific methods — on each of which he has left several outstanding books. He made a thorough examination of the passage of light through various media and discovered the laws of refraction. He also carried out the first experiments on the dispersion of light into its constituent colors. The main work of Ibn Al-Haytham the ‘Kitab Al-Manadhir’ (The Book of Optics) was translated into Latin in the Middle Ages, as also his book dealing with the colors of sunset. He dealt at length with the theory of various physical phenomena like shadows, eclipses, the rainbow and speculated on the physical nature of light. Ibn Al-Haytham is the first to accurately describe the various parts of the eye and give a scientific explanation of the process of vision. He also attempted to explain binocular vision, and gave a correct explanation of the apparent increase in size of the sun and the moon when near the horizon. He is known for the earliest use of the camera obscura. He contradicted Ptolemy’s and Euclid’s theory of vision, that objects are seen by rays of light emanating from the eyes; according to Ibn Al-Haytham’s theory the rays originate in the object of vision and not in the eye. Through these extensive researches on optics, he has been considered as the Father of Modern Optics. The Latin translation of his main work, the ‘Kitab Al-Manadhir’ has contributed a lot to the Western science, and exerted a great influence upon Western scientists, for example on the work of Roger Bacon and Kepler. It brought about great progress in experimental methods. His research in catoptrics centered on spherical and parabolic mirrors and spherical aberration. He made the important observation that the ratio between the angle of incidence and refraction does not remain constant and investigated the magnifying power of a lens. His catoptrics contains the important problem known as ‘Alhazen’s problem’. It comprises drawing lines from two points in the plane of a circle meeting at a point on the circumference and making equal angles with the normal at that point. This leads to an equation of the fourth degree. In his book ‘Meezan Al-Hikmah’, Ibn Al-Haytham has discussed the density of the atmosphere and developed a relation between it and the elevation. He also studied atmospheric refraction. He discovered that the twilight only ceases or begins when the sun is 19° below the horizon and attempted to measure the height of the atmosphere on that basis. He has also discussed the theories of attraction between masses, and it seems that he was aware of the magnitude of acceleration due to gravity. 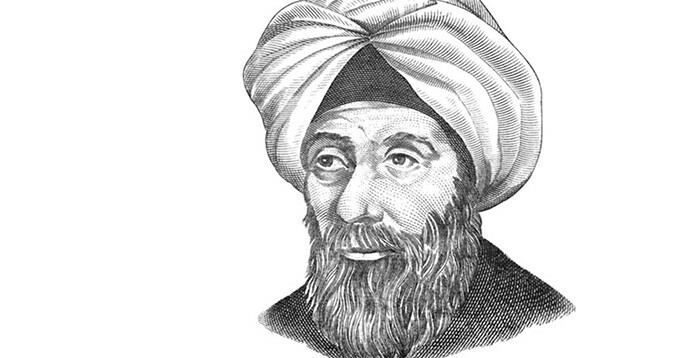 Ibn Al-Haytham’s contribution to mathematics and physics was extensive. In mathematics, he developed analytical geometry by establishing a link between algebra and geometry. He studied the mechanics of motion of a body, and was the first to maintain that a body moves perpetually unless an external force stops it or changes its direction of motion. This would seem equivalent to the first law of motion. The list of his books runs to 200 or so, very few of which have survived. Even his monumental treatise on optics survived through its Latin translation. During the middle Ages, his books on cosmology were translated into Latin, Hebrew and other languages. He has also written on the subject of evolution, a book that deserves serious attention even today. In his writing, one can see clear development of the scientific methods as developed and applied by the Muslims, comprising the systematic observation of physical phenomena and their linking together into a scientific theory. This was a major breakthrough in scientific methodology, making it distinct from guess-work and conjecture, and placed scientific pursuits on a sound foundation comprising systematic relationship between observation, hypothesis and verification. Ibn Al-Haytham’s influence on physical sciences in general and optics in particular, has been held in high esteem and, in fact, it ushered in a new era in optical research, both in theory and practice.